Through all the battles the past few weeks, I am happy to let you know how VICTORIOUS our Heavenly Father has been. This will be a long post….there’s just no way to shortened it. I’m going to start with the most exciting news of all! This is 17 of our new brothers and sisters in Christ! The very first morning I taught last week in Northern Uganda, I taught about salvation. Often here, there is not a clear understanding as many have combined different beliefs from different religions. As my teaching time ended I felt so strongly that some who had been listening might not truly be born again. I never could have imagined the harvest God was reaping. One by one they stood up…then turned to those around them and shared that they were surrendering their lives to Jesus. What a VICTORIOUS moment as I watched God change them. The rest of the week as I taught, it was a wonderful experience to see them grow as they understood more and more about their new faith in Jesus. The entire trip brought about much joy as well as much sorrow as I listened to their stories of war time. 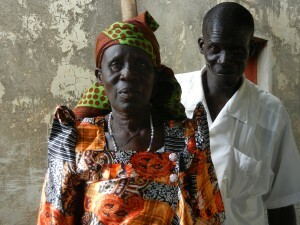 This is Pastor Julius whom I served with, he is pictured here with his Mother…a precious woman of God. 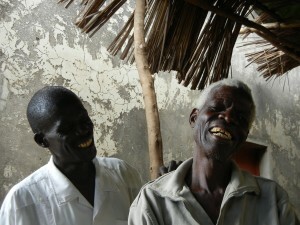 Pastor Julius fled about 15 years ago when the rebels came through and were killing everyone. His mother and father stayed behind to try and protect anyone from taking their land. 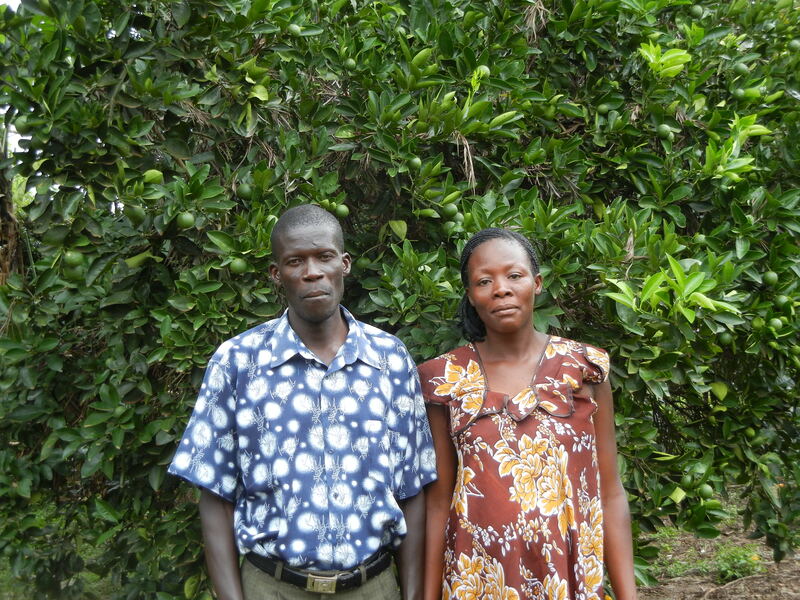 During the raids of the rebels, his Mother was attacked….beaten, put into a shallow grave and left for dead. By the grace of God she did not die and although she is crippled for life, she is happy and praising God for keeping her alive. Not until last year did Pastor Julius return and he did so to start a church. Now he has 4 church plants up and going. 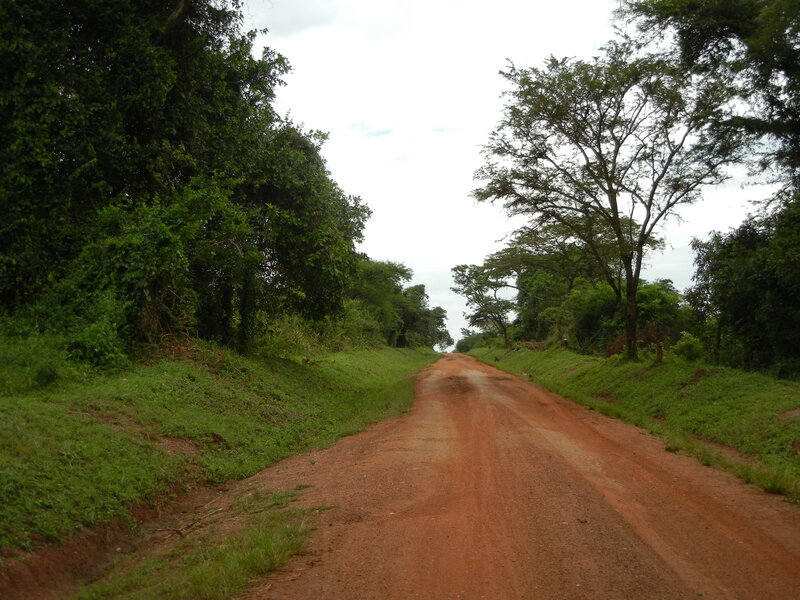 As we drove the countryside, it was different than any other area I have seen in Uganda. One particular stretch we traveled down a dirt road more than 2 hours. All along the way there were no huts or homes, no indication that the lands were populated. I inquired of Pastor Julius as to why it was so empty. He shared that these lands used to hold many families…generations of families, but the war killed most of them and those who didn’t die, fled and have never returned. He told me a story about this tree. He said on one particular day many people had gathered here where this tree is for some event. The rebels came and slaughtered (his word as he said they slit their throats just like you would slaughter an animal) more than 300 people. They piled all their bodies up under this tree. 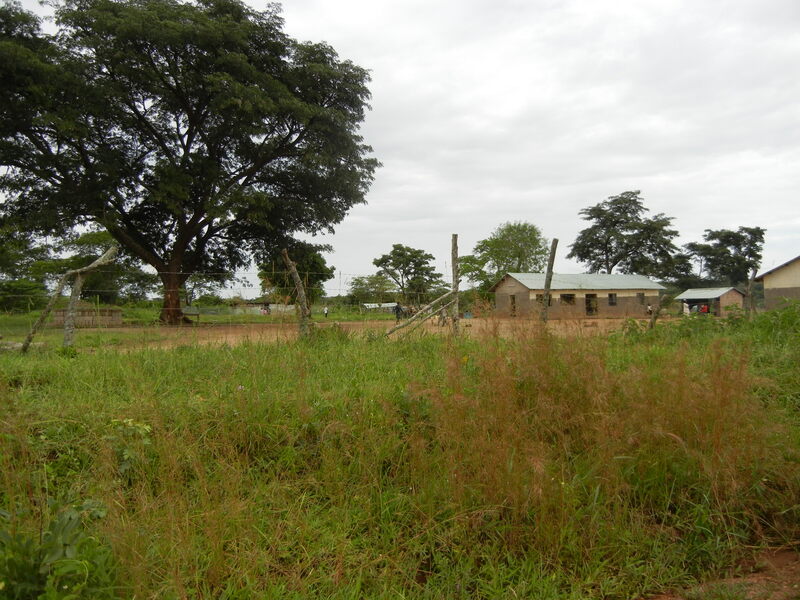 The dwellings you can see to the right is a small orphanage that was built to house the orphans left. I met some wonderful people who have suffered more than I could ever imagine surviving. The elderly people at the conference were a joy to my life! I could have spent weeks with them just listening about their lives. 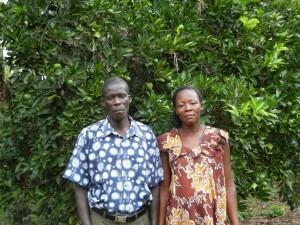 Pastor Julius and his wife Margaret are expecting their first child in a few weeks. 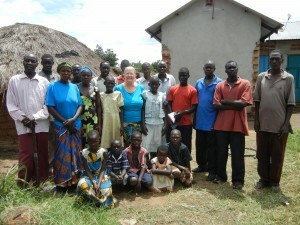 They are so excited…please pray for her as they have experienced the loss of 3 children in miscarriages. Pastor Julius will be 47 years old on his birthday. Because of the war and having to flee he decided to spend his life serving God in other places. He didn’t think he would ever marry….it seemed impossible because he couldn’t take his bride home. Yet, 3 years ago, God brought Margaret across his path and today they are serving side by side in the village where he grew up. She is a school teacher and her hope is that one day she can start a school there in the village. 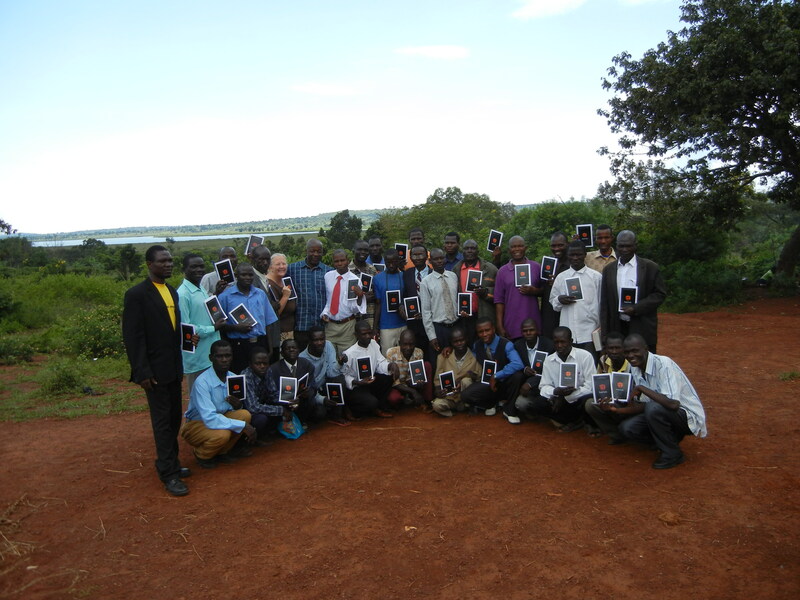 In the past few weeks, not only did I make this amazing journey to Northern Uganda, I also had the great privilege of watching both of my Bible Skills Institute classes graduate from their first year. My Busia class excelled in all their work. The lowest GPA was a 80.9. I am so proud of them! 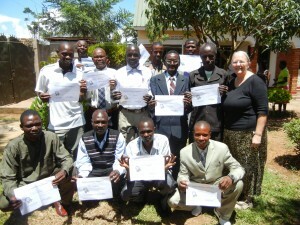 My Lake Victoria class worked very hard and also excelled. Their grades were calculated differently and some of their grades were lower than the Busia class, but most importantly they all passed and are now eligible to begin their second year in January. 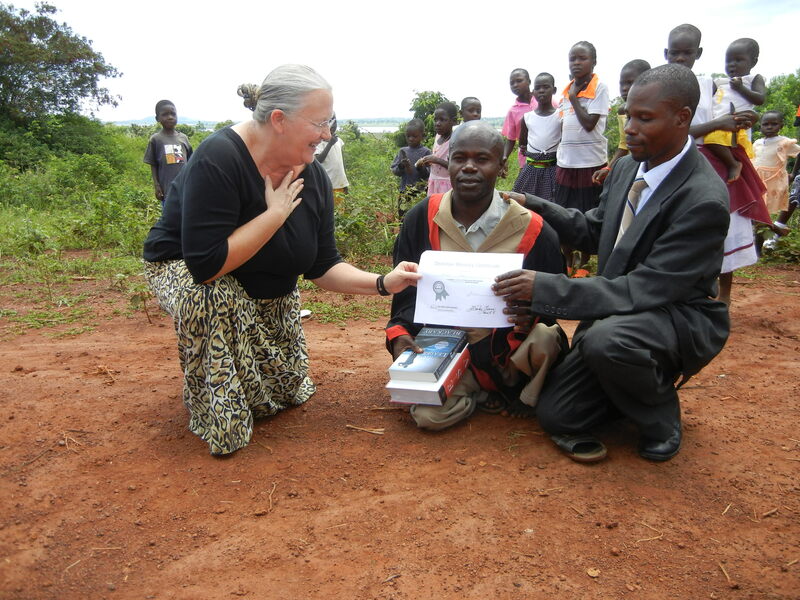 One of the pastors in the Lake Victoria area, Pastor John Minor doesn’t have legs that work. They hang aimlessly from his body and he walks with his hands. Every week to attend this class he walks with flip-flops on his hands for many miles to learn the bible. Oh what is awaiting him one day in heaven! Also in the past few weeks I’ve had the privilege to take Secret church teachings to the bush! 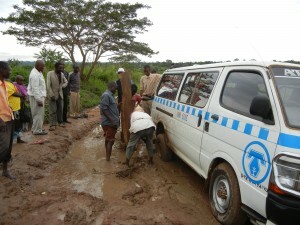 The first time we arrived a little late…as you can see the van got very stuck! Never a dull day when you're traveling in the bush! Oh but what fun we had! This little church had never had anyone come and do any teaching! Secret Church goes to the bush! How awesome that their first experience was an in-depth teaching by Pastor Platt! This past weekend was filled with Secret Church activities. I arrived home from Northern Uganda late on Friday evening. At 2am which was 6 pm time in Birmingham I got up and watched the Secret Church simulcast. What a great lesson was taught. If you did not participate, please check their website as in the days ahead as the podcast will be available. Everyone should invest the 6 hours to watch this particular teaching. It will make a difference in your life and lives of your family. 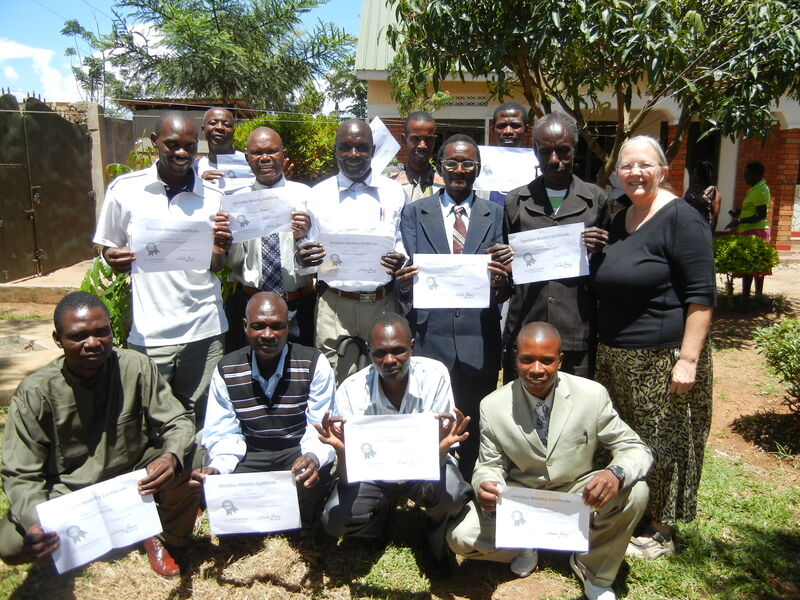 At 8:00 Saturday morning I took my Busia Bible Skills Institute class with me and traveled down and joined our Lake Victoria class for a day of Secret Church. The Lake Victoria class had never experienced a Secret Church teaching….now they are anxiously waiting for us to be able to do it again! There wasn’t much sleep for me ….but I was immersed with all that good teaching! 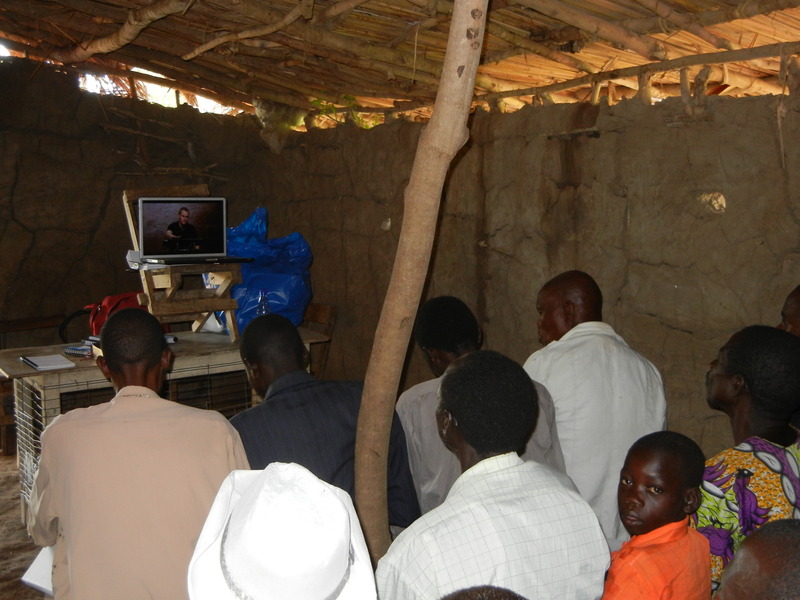 This week I teach Wednesday and Thursday to the Busia district churches. Friday, I finish last minute tasks…and then Saturday I am headed home to be with my family! My schedule next week cleared and there was nothing stopping me from changing my ticket and getting home a week early. God has been so good and His name has been high and lifted up and I am not complaining….but I am running on empty and need time with my family. When I called Dana to let her know I was coming home early, she was picking up my youngest grandson Isaac from school. I haven’t seen him since he started pre-school and when he talked to me on the phone he spelled his name for me! I miss so much of their lives while I am away, yet I am most thankful to be able to serve the Lord full time and still get to see my family some as well. This time here has not been as easy as before, and I truly am in need of a break. I look forward to a few weeks of being a Momma and a Mommaw. I’ll be home until the first of January, so I should be filled up with lots of love by then and be renewed and ready to head back to battlefields here. Please keep me in your prayers this week as I go out and share Gods love. Also pray for my trip home to be safe. And one last thing I would like to ask you to pray about…my brother Paul is having a stint put in today. Please pray that all will go well and he will heal quickly. Can’t wait to see him when I get home. The Life and Mission of Joy Breedlove is powered by	WordPress 3.4.2 and delivered to you in 0.179 seconds using 40 queries.